Desire to Decorate: Paper lanterns and bunting, take 2! We found a new home for the paper lanterns and bunting from Evan's 1st birthday. 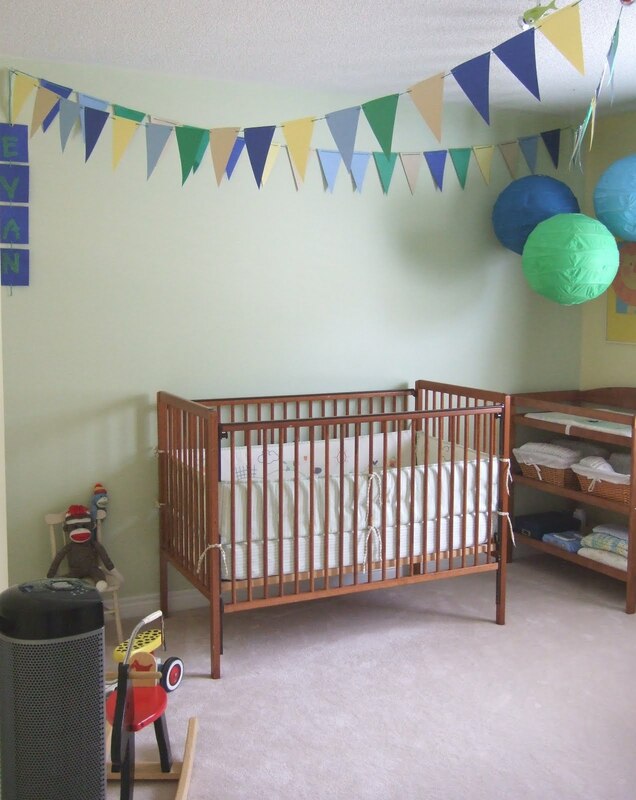 Such a simple and nice way to dress up the nursery until we redo his room. Now, when Evan wakes in the morning or from naps he's chatting up the lanterns and flags... pointing at everything. Funny thing is, we have a fan in his room so everything has alittle movement which I'm sure is part of the entertainment. I've been thinking that I'll reuse the paper bunting for Evan's big boy room but since theme includes red, you can read it here, I'll restring the flags to include red. Just a thought for now so we shall see. This was such a fun project, I'm so happy we took the time to do it!